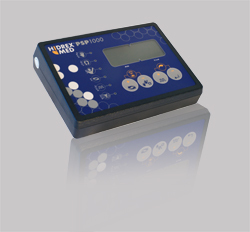 For comparing iontophoresis machines for a buy or a change out decision, you have to take into consideration the " ICF - the IontophoresisCompareFactor"
!!! (a direct current is a pulse of 100% and is is a average value - if this is not shown correctly from the device, we have fantasy values) !!! **To compare machines, you have to calculate this: What the machine will show you (will it show you maximums or average values or fantasy values?) or what the manufacturer wants to make you believe it can deliver? For example, do you have a strange feeling when a manufacturer tells you that a device with a tiny battery can deliver you a stable, professional and strong current? Where shall it come from? From a 1.2 volt battery? From 2 or 4 batteries? With 4 batteries in a row, you only have 4.8 volts! 60 V x 30 mA @ 2Kilo Ohm and it shows you average values - this is state of the art and the maximum the medical law allows. These are values from a professional iontophoresis machine. 72 V x 25 mA @ 2Kilo Ohm and it shows you average values - this is state of the art and the maximum the medical law allows. These are values from a professional iontophoresis machine. For the Hidrex PSP1000, we have an ICF of 3600 "Hidrex units" (60*30*2) in direct current mode, also for the Idromed we have a ICF of 3600 "Hidrex units" (72*25*2) compared to direct current mode. For both Hidrex and Idromed: More would not be allowed for home usage. We have here a maximum value that sets the standard of comparison for other iontophoresis devices. We can say the Hidrex PSP1000 has 3.75 times more power at the highest settings at the same body resistance than the other machine (XY). From our experience, we can say that we have not heard of anyone that can tolerate the full power of the Hidrex PSP1000 at full power in direct current mode but, there are many that can handle full power with a 90% pulse rate. Do you build a voltage or current driven device? This makes a huge difference because you can feel a voltage change more than a current change. Does it run on batteries or a main power supply? With a battery driven iontophoresis machine, you don’t have to take as much care for security. You don’t have to build in double redundant security and current circles. On the other hand, it is easy to see that such (add space) a machine can only deliver limited current. If you try to hack the current with a battery driven device to get a pulsating direct current, you are limited once again by the current the batteries can deliver.How much Voltage can be delivered? At a certain voltage range, the feel of the current (in order on the deliverable current strength) is better. This bandwidth is at 50-70 Volts. This affects only high power iontophoresis applications and is not true for tiny currents. Do you design the iontophoresis machine and the electrodes to last a lifetime? There is also a difference in how you measure a current. Hidrex measures it on 2 Kilo Ohms and it will deliver up to 60 Volt @ 30 mA at this resistance. (This is a normal body resistance with wet hands due to sweating and the tap water for used to facilitate the current flow through the distance grids or towels to the skin). If your body resistance is higher 2 Kilo ohms (for example, double the normal) of 4 Kilo Ohm, the device can deliver a maximum of 60V @ 15 mA. If you want it to deliver 30 mA, you would have to increase the voltage up to 120 Volts to get the same mA at the given body resistance! This is an absolutely unreasonable way and, in the most cases, deadly (in the U.S. the network runs at 110V, so who has the desire to stand more than the - according to the medical right - maximum).